Tonight Meg made, or helped make, a rain forest. Are you wondering how she might have done this? Well, I'll tell you. It all started one day when Megan wanted to learn how to twist balloons like her grandpa. Yadda, yadda, yadda. Blah, blah, blah. Fast forward to today. Mickey dropped her off at the Mishawaka public library where the balloon twisters have their monthly meeting. 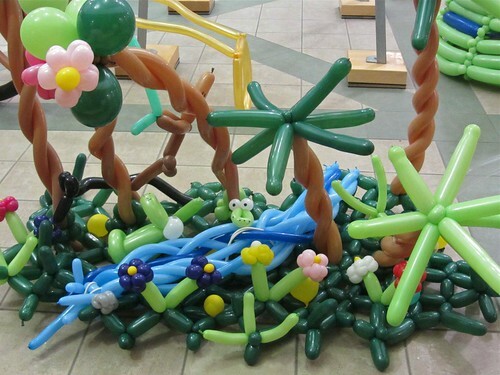 For the last 3-4 summers the group has been making a large balloon sculpture for the patrons of the library to enjoy. This year's theme is "One World, Many Stories". All of the balloon artists made different sculptures to represent different parts of the world. Megan, with Tio's help, made a rain forest. It turned out pretty cute. Not shown: an igloo, two pyramids, a teepee with a campfire, a rickshaw, and something else I can't remember. If you have time in the next couple weeks go check it out. Most of that was Megan's idea and design. She started with the animals and when Tio got there I asked him to work on the green base. I showed Megan how to twist one flower, she made the rest and then moved on to the trees. They both worked on the river and I think Tio made a couple of trees. They both did an outstanding job !!! Looks great! We saw Twister Mike on the news but did not catch Meg. That is darling! What an awesome idea!